Antonio Carlos Jobim The Girl From Ipanema Free Guitar Tab by Jeffrey Thomas. I am following the original version of this bossa nova classic in the key of Db. Most of the jazz charts I have seen show this tune in F but the original is in Db. Make sure you do your homework on tunes! My tab arrangement tries to get the proper rhythm, chords and fills. 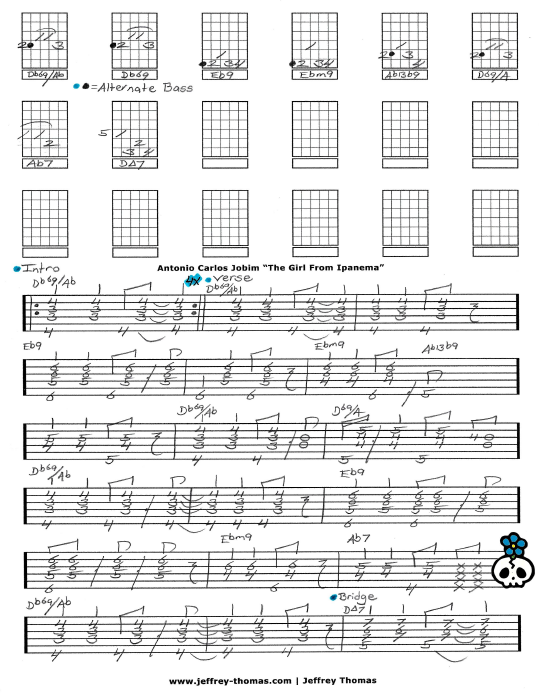 Want the full guitar tab for free? Send in your email address using the form provided. Looking for the best online guitar lessons? Fill out the Schedule A Free Lesson from to set up your free guitar lesson today! “The Girl From Ipanema” was a worldwide hit for Mr. Jobim and won a Grammy for record of the year in 1965! Find more great online guitar tabs on my blog, video and tab pages.